Some runners choose to follow training principles and strategies that have been carefully developed and refined over the course of decades — and others simply train and race by feel. Ultimately, it doesn't matter which kind of runner you are, because anything that motivates you to exercise regularly is a positive thing and should be celebrated! But runners who rely on feel may never seize the big performance gains that can be achieved by slowing down. There are many established training methodologies you can experiment with and adopt, but in this post we're specifically looking at "polarized training". This is a concept that was popularized by renown exercise scientist Stephen Seiler, and the basic idea is to focus on two intensities: easy runs and demanding, hard runs. The easy ones serve two purposes: they build and strengthen your aerobic base, and they allow proper recovery from the hard workouts. In a way, the principles behind polarized training are counterintuitive. There's a common assumption that running more miles at faster speeds is the pathway to improvement. As time goes on, runners assume they must strive for faster training benchmarks and bigger miles. Instead of regularly getting the benefits of easy runs, they primarily execute demanding workouts, often without realizing it. Their runs are hard, their miles are large, and their overall paces are fast. Unfortunately, the place where this approach falls down is the finish line. Pushing hard like this provides initial improvement, but shortly afterward progress stagnates. New PRs will be rare and marginal, or nonexistent. Polarized training will have you doing a greater number of slow runs, but this method isn't about taking it easy. The hard days, which typically hit twice a week, will seriously challenge you. One of the points of the easy days is to remove the suffering from training, but these runs can be long, and the focus isn't about relaxation — it's about improving as an athlete and building toward something great. If this sounds appealing, you should first embrace zone-based training. You need to learn to control your intensity so your easy runs are easy, and your hard runs are hard. Doing runs where you faithfully stay in zone 2 requires discipline, and one of the best ways to stay on top of it is to keep an eye on your GPS watch to make sure you haven't unknowingly entered zone 3. It's best to wear a heart-rate monitor on every run, and to test your zones regularly so you know they're up-to-date and accurate. Using the default zones that came pre-installed on your watch is not an option. Your zones can be based on your maximum heart rate, or they can be based on Lactate Threshold Heart Rate, or LTHR. This involves a demanding 45-minute run, and you can do it by yourself with just a GPS watch and a heart-rate monitor. Full information and detailed instructions for this test can be found in our Determine Your Lactate Threshold post. This test equips you with your current LTHR and your current threshold pace, which you can use to set your pace zones. 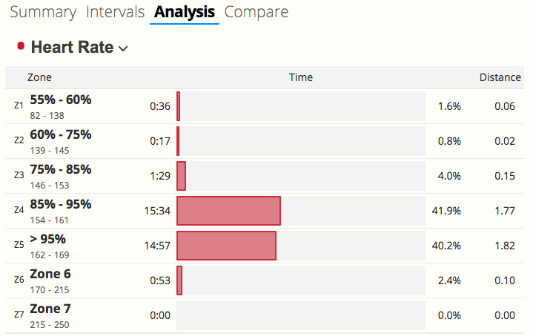 If you use a running power meter during this test, you will get your Running FTP as well. When you're done, you must update your zones in your Training Options in SportTracks, and in the settings of your watch. Depending on how much time you have to train, a typical week could have two hard workout days that are separated by at least two days. This creates a microcycle with hard days that will truly push you, and it gives you enough time in zone 2 to fully recover. 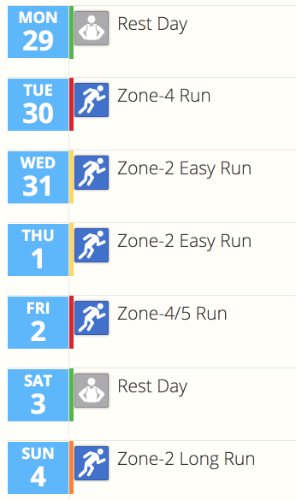 The zone 2 days provide more than just recovery, though. This is where your base aerobic fitness is built, maintained, and improved upon. If you're already committed to a structured training plan and working toward a goal race, it's best to complete your program as planned. But going forward, consider giving polarized training a shot. Even though you'll be running slowly much of the time, over time you will see your PRs fall. Hi SportTracks! It would be nice to have training polarization view in analysis module for week, month and year perspective.